This is the ninth and final entry in a column about reporter Ethan Fowler’s participation in the Bainbridge Island Police Department’s Citizens’ Police Academy. Keeping the waters surrounding Bainbridge Island safe is something Bainbridge Harbormaster Tami Allen and Bainbridge police officer/marine patrol officer Ben Silas continually focus on. Allen, who will reach her 15th anniversary as the island’s harbormaster in July, said the Bainbridge Harbor Management Plan was started in 1999. It covers safety and navigation, water quality, anchorage and mooring, public access, maritime commerce and derelict vessel prevention. Allen said she keeps tabs on 53 miles of water, which include four deep water bays. She said there’s more than 550 buoys around the island and that all of them require permits. She noted it took five years to log all of the buoys. She said she’s always looking for volunteers for the Summer Dock Host program, where people greet boaters as they step off their boats and answer questions for them. Allen said one day last summer featured visitors who spoke 14 different languages. She said she gets a lot of help with her job from volunteer harbor stewards, residents who live along the shoreline and call her when they see anything worthy of her attention. Silas, who started working the same day 15 years ago as his future wife Carla for the BIPD, pilots the department’s 35-foot, state-of-the-art police boat. He said the boat was funded through a $640,000 Homeland Security grant in 2008 and has the ability to load a SWAT team on a Washington State Ferry. When he first joined the force, Silas said he had no interest in boats but he has since grown to “really love it.” He said his jurisdiction extends halfway between Bainbridge and the nearest piece of land, however he has law enforcement powers for the whole state since Silas said there’s fewer resources for the water. He said he goes riding around the island at least once a month and more frequently during the busy boating season. For the final week of the two-month Citizens’ Police Academy, the group of about a dozen people gathered for a potluck dinner at the Queen City Yacht Club. The celebratory evening was highlighted by Officer Dale Johnson demonstrating the skills of his retired K-9 partner Rusty, who delighted a lot of the children of the academy participants. Rusty was able to successfully find hidden money that had drug scents on them. During his career, the chocolate lab mix was used in 214 searches with 547 finds of controlled substances and or drug paraphernalia. He also assisted in 181 arrests. Bainbridge Police Chief Matthew Hamner said he hopes to have another K-9 officer in the near future. I truly enjoyed participating in the Citizens’ Police Academy and learned a new appreciation for police officers and greater understanding of the challenges they face. I was particularly impressed by how much Bainbridge officers treated academy participants like they were family. I will also miss the amazing treats that Officer Carla Silas, who organized the academy and scheduled the speakers, created weekly for us. I highly recommend everyone in the community to try to find time to participate in a future Citizens’ Police Academy, which are generally offered yearly in the spring. The historic tugboat Chickamauga will be towed out of Eagle Harbor Marina at 6 a.m. Friday. BAINBRIDGE ISLAND – The derelict historic tugboat Chickamauga is set to be towed out of Eagle Harbor Marina at 6 a.m. Friday, the Washington State Department of Natural Resources announced Thursday afternoon. 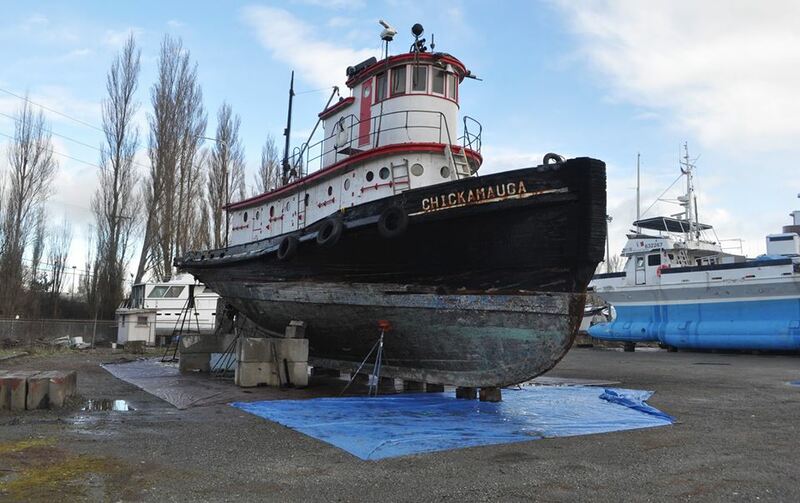 The abandoned tug, which sank in the harbor Oct. 2, leaked oil and diesel fuel, and was raised by a crane Oct. 10, will be towed to Boat Haven Marina in Port Townsend. 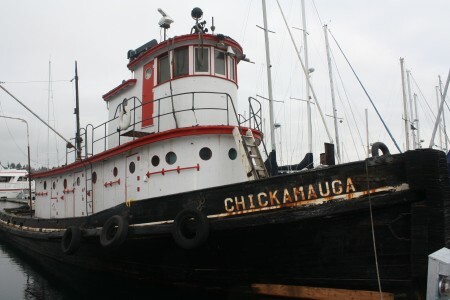 DNR took custody of the tugboat — the country’s first full diesel-powered tugboat when it was built in 1915 — on Jan. 16 after the owner didn’t to remove the vessel from Eagle Harbor Marina. The state attorney general’s office also filed three criminal charges against the owner on Jan. 15. A documentary film about Bainbridge Island’s anchored-out liveaboards is set to screen at the Celluloid Bainbridge Film Festival on Nov. 2 at 10 a.m.
Island filmmaker Mark Davis worked on “Against the Tide” for years, filming numerous city meetings and interviewing people on both sides of the liveaboard debate. “Set amidst the spectacular beauty of the Pacific Northwest and the urban backdrop of Seattle, Washington, this poignant and timely film reveals the unique lifestyles of the mariners and misfits who live illegally aboard their boats in Eagle Harbor, the scenic gem of Bainbridge Island. Long a refuge for liveaboards with limited means, or just those wishing for a simpler way of life, Eagle Harbor is a state-owned body of water surrounded by an affluent community, torn about whether to let them stay or drive them out. Bainbridge Island is one of three Kitsap cities hosting National Marina Day festivities Saturday. Similar Marina Day recognitions will take place across the country this weekend. Events are scheduled at Waterfront Park from 10 a.m. to 4 p.m. One unique activity planned for Eagle Harbor is an “anchoring with a local” workshop. Boaters will partner with an island mariner to learn how to anchor in 30 feet of water. Back of Beyond Outfitters will offer a free “small boat mess-about” all day. There will be a rodeo for small non-motorized boats, demonstrations, and canoe tours of the harbor. Participants can bring their own craft or rent one on-site. Other Marina Day activities will include free vessel examinations, a flare demonstration, sailboat rides, ROV hull inspections and rigging lessons. Eagle Harbor also welcomed a special guest this week. MV Lotus (pictured above) is anchored off the Harbour Marina. Lotus will be on hand this weekend and on June 15-16 for the Bainbridge Wooden Boat Festival, according to the Lotus page on Facebook. Lotus was launched in 1909 and has plied Puget Sound and the Inside Passage for more than a century. If the legend of Santa Claus were formed on the shores of Puget Sound rather than than northern Europe, he likely would wouldn’t have reindeer or a sleigh. The Northwest-born Santa would be an old sea captain, and he’d fly around in an dory pulled by (what else?) eight tiny blue herons. This is how Bainbridge historian Jerry Elfendahl envisioned Santa for his Eagle Harbor version of the classic “The Night Before Christmas” poem. With the poem finished (and now illustrated in poster form available at Custom Printing and on place mats at the Harbour Public House), Elfendahl set to work with an old dory, a bunch of pink flamingos, some campaign signs, paint, lights, a white beard, and a p.a. system to really bring his “Captain Nick” to life. Read more about the fun Elfendahl and his buddies have been having here. And to see Captain Nick in all his glory, head down to Waterfront Park tonight (Monday). Elfendahl and his floating creation will be a part of a second Christmas boating parade from 5 to 7 p.m. I had the honor of visiting local legend Dave Ullin aboard his tugboat last week. Ullin is revered by many on the island for his self-sufficiency, integrity and generosity. Many more only know him as a strikingly uncommon sight: a big man with big hands wearing thick wool pants, suspenders and a bag full of archaic tools tromping through Winslow. You don’t see people like Ullin much anymore. He looks like a man who stepped out of the old Hall Brothers Shipyard, circa 1892, and into modern Winslow. Going below deck on Ullin’s tug is like taking that step in reverse. The boat is a living museum of old logging, fishing, farming, blacksmithing and shipbuilding equipment. All fitting snugly in designated spots. And it’s full of innovative touches, like Ullin’s custom-built hinged bunk, his kale sauerkraut-making operation, his clothes-mending station and a compact little workshop, complete with a 100-year-old drill press and tools Ullin forged himself. I could go on and on about Dave Ullin. And I did, in THIS profile. Ullin’s future is uncertain. The state gave him and the other dozen or so liveaboards eviction notices last month. There is some late-breaking hope, city leaders say, for a compromise. I detail that development HERE. Check in on Wednesday to see where that proposal goes. The City Council is set to vote on a new plan that may allow as many as 14 liveaboards to remain anchored in the harbor. A wooden boat school on Eagle Harbor? The Northwest School of Wooden Boat Building is one of two parties that have expressed interest in leasing a portion of Eagle Harbor waterfront from the city. 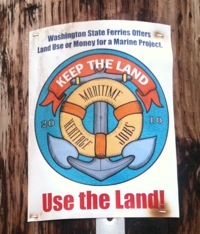 Washington State Ferries would hand over a nearly one-acre portion of its maintenance facility to Bainbridge, which would lease it to a firm for a boat haul-out facility or other marine use. Seaview Boatyards and the Port Hadlock-based wooden boat school sent letters of interest this month. The city is also pondering a $2 million offer from WSF to abandon its claims on the property. The money would be restricted to water-dependent uses. None of it could be used to bolster the city’s general fund. One spending option is to build a city-run marina on Eagle Harbor. Last night, Mayor Bob Scales led a community discussion about the $2 million offer. Tonight, Councilwoman Debbi Lester is scheduled to lead a discussion on taking the land rather than the money. The discussion begins at 7 p.m. at City Hall. For more, read today’s story by Ed Friedrich. It appears that a dirty diaper is what led to concerns last week that Waterfront Park’s beach may be contaminated. On Tuesday, the Kitsap County Health District took a water sample near the castaway diaper, which may have drifted up or been tossed on the Eagle Harbor park’s shore. Test results showed the water contained unhealthy levels of bacteria. An announcement of the results by the state Department of Ecology led to some concerns that the beach would be closed. But a second sample taken shortly after the diaper was removed showed the beach’s bacteria levels had returned to normal. The diaper had essentially created a small “hot spot” near where the samples happened to have been taken. The health district has a position on non-potty trained children frolicking on public beaches. “The health district advises that if a toddler is not toilet trained, they not swim at a public beach,” Whitford said. Whitford believes the bacteria died off fairly quickly. “Because it’s saltwater and there was a lot of sunlight, nature took care of the contamination,” he said. Health officials are lifting the 10-day no-contact advisory for Eagle Harbor and the shorelines between Yeomalt Point and Rockaway Beach. The advisory was initiated shortly after a sewer pipe on the harbor’s north shore began leaking raw sewage. 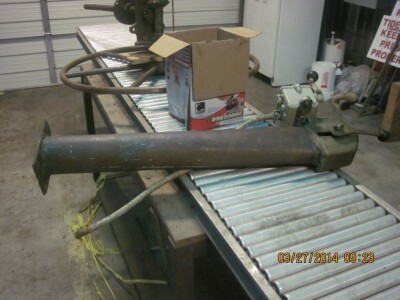 An estimated 140,000 gallons of sewage seeped out before city work crews fixed the leak on June 2. Two sets of water quality tests in the harbor show normal levels of bacteria. “Our two sampling events at Waterfront Park showed no impact from the spill,” Kitsap County Health District water quality specialist John Kiess said today.